Venezuelan President Maduro’s arrest of Caracas Mayor Antonio Ledezma reflects a new level of vindictiveness and almost desperation at home – and threatens to leave his government more isolated than ever in Latin America. 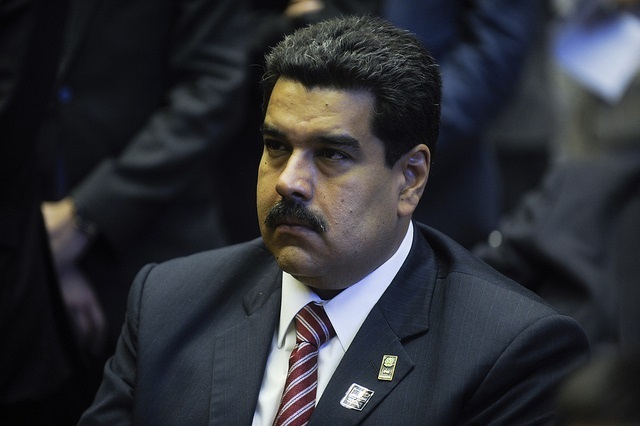 In a three-hour televised speech, Maduro alleged that the mayor, whom he called a vampire and fascist, was plotting with military officers to remove him from office. Ledezma has been a strident opponent – playing a prominent role in last year’s salida movement – and the Associated Press cites unnamed sources as acknowledging the existence of identified coupists. But Maduro’s evidence against Ledezma was negligible, mostly a document on a national transition accord. Other Maduro opponents are also reportedly to be arrested soon. At the same time, the President said that the U.S. Embassy was trying to turn the military against him by, he alleged, calling generals’ wives to say their U.S. visas were being revoked. The increasingly repressive nature of the Maduro regime is drawing scorn from throughout Latin America, including countries that previously tolerated the excesses of deceased President Hugo Chávez. UNASUR has announced it will hold an extraordinary meeting soon on the deepening crisis caused by Ledezma’s arrest, and the Foreign Ministers of Brazil, Colombia and Ecuador will make an urgent visit to Caracas this week. Chilean President Bachelet and Senate President (and daughter of the assassinated President) Isabel Allende expressed their “concern” over the arrest. Colombian President Santos, heretofore restrained in his criticism, told the press he was “worried.” Amnesty International also condemned the action. Washington’s vehement denials of Maduro’s allegations that it was involved have not been challenged. Maduro’s Latin American neighbors are likely to continue hewing to traditional non-interventionism, but even the left appears to regret that recent events confirm the monumental squandering of the Chávez revolution’s opportunity to carry out a radical project of redistribution and propose an alternative model for the region. Chavismo had a social base, but Chávez and, to a much greater extent, Maduro have failed to develop a democratic or economically coherent approach to their revolutionary project. Venezuela is now paying the price and, as many predicted, the situation is getting worse before getting better. It is impossible to say how and when the impasse will break, and hard to identify who’s capable of ending the misery – be it the military or a faction within Maduro’s own party. It’s clear, though, that this crisis is not sustainable and regional patience with it is growing thin. International recognition of the rogue/abusive nature of the Venezuelan regime has been extremely slow in coming, in spite of the overwhelming evidence to that effect. This has been possible due to the ideologically driven astigmatism of a large portion of leftist intellectuals, movie actors and academicians from the U.S. and Europe, which tend to give a blank check to dictatorial regimes from the left, such as Cuba, Nicaragua, Venezuela, Bolivia or Argentina. In some cases, such as French Ramonet, U.S. Danny Glover and Spanish “PODEMOS” political party, to name just very few, this support has been “oiled” with millions of dollars/Euros from previously rich Chavismo. This is slowly dissipating. Tragically, it is late to save Venezuela from material and, sadder, from spiritual ruin. Crossed a line? This regime crossed the line a long time ago. This seems outrageous but it fits in a pattern A weak government, facing deep problem but still with control over its security forces. Its response is to undertake some economic measures with one hand, and with the other to criminalize opponents, and if possible, change the rules of the game. Eliminate opposition figures. Let’s see what the elections end up looking like like. Dan Levine’s comment is, as always, appreciated. That the line between democratic and authoritarian rule in Venezuela had been crossed some time back is certainly clear. The point we intended to convey with this title was that a line had been crossed *for Latin American governments,* whose patience with the incompetence and brutish behavior of the thuggish government in Caracas will now have run out. Our sense is that over at least the past year or so there has been a consensus among Latin American governments that the rulers in Venezuela were behaving in a manner that was both reprehensible and profoundly destructive of both domestic and regional stability. However, commitments to non-intervention in domestic politics are deeply rooted throughout the region, and the tactics chosen by a substantial portion of the Venezuelan opposition ensured widespread unease among governments throughout the region. The idea that the way to topple an authoritarian regime is to provoke havoc in the streets and thus render a country ungovernable, with a vague notion that this would somehow trigger the salida of an elected (albeit dictatorial) government, never made any sense (and still doesn’t). And it guaranteed that all but the US would shy away from espousing the opposition’s cause. It was folly to imagine that South American governments would abandon rulers challenged by forces that would seize power by provoking chaos. But the recent escalation, culminating (for now) with the detention of Ledezma, in our view marks a “crossing of a line.” By that we mean that governments in the region will now perceive the continuation of the Maduro government as the principal threat to stability and, accordingly, will abandon their reluctant support. Had the opposition united a year or so ago around a strategy of assembling a strong electoral majority to remove the government through a recall referendum in 2016, and to put in place a national unity government to re-establish democratic rule, there would have been overwhelming support across the region. Among the key questions that arise at this juncture are whether the opposition is capable of articulating a national unity agenda, and whether Venezuela or its neighbors can tolerate another year or so of this remarkably irresponsible misrule. The answers to both are uncertain, but our assessment is that through its most recent actions the Venezuelan regime has created a situation where the preponderance of opinion in Latin America is that the sooner this government is replaced the better. I understand the point being made here, but I am not so sure either about blaming the opposition (or segments of it) or about the possibilities of a solution via international mediation and or a recall election. I wish I were more optimistic, but as I see it the path to a recall election is neither clear nor easy. There is or should be concern about the quality of elections. – Would there be international observers? – How would state resources play in media? – Would there be any real check on intimidation? – Who would guarantee the electoral register and under what conditions? The point is this: although elections are the solution we all would prefer, it is important to ask about the conditions and quality of the process.